Hope everybodys week is going swell so far, It has been a rather chilled day in general I like it. A cold glass of Fanta and a bourbon would go down a treat right now though. I've literally just spent the past 3 hours playing Zombies on PS3.... Revealing the inner gamer geek. If everyone could check it out and like it, It would be much appreciated! I HAVE A BRAND NEW BOOT I MUST SHARE WITH YOU ALL! in a deep, powerful, mindblowing LOVE for these beauties. And they started to sell pretty damn quick, so I crept into my savings account and accidentally splurged a chunk on these. It was sweet temptation I couldn't resist. I am more than glad I purchased these when I did, since my size has officially sold out! "Life is too short to not own perfect clothes"
...or shoes in my case. ....And you haven't met my 50p beauty of a shirt yet have you? people kind of... over exaggerated. 'Cos these badboys fulfill all levels of comfort! Even though the heel looks massively chunkified, It is also a flatform too, which balances the heel out to make it not feel as if you're wearing a 'heel', it's just more of a slope. A warm, bouncy, toe welcoming slope. My feet are a massive size 7, which is a tad odd for someone who is only 5ft3, and yes they do fully suceed in making my feet look like scuber divers, but it is worth it. The gothic 90's theme to these is bang on trend with the grunge wearers, but also make you feel like a bit of a Spice Girl too. 10/10 for both looks, and comfort. Black & white chromo top, teamed with a much needed dash of vibrance. Mustard is a big hit with me at the moment. 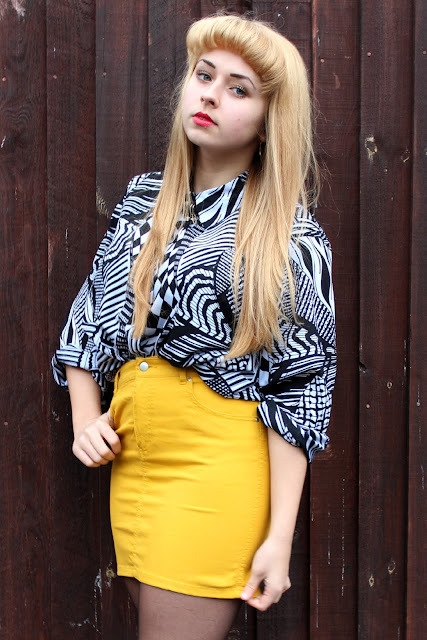 And I've never seen a mustard denim high waist skirt before so had to have it! Especially at a beautiful £7.99, Thank you H&M. Either comment here or tweet! those shoes are actually perfect! think I really need them..
You're right those 90 style boots are beautiful! those boots, WOWSER! amazing! need to get my mits on a pair of those! in love with those shoes! if they've sold out of size 7 then they've prob sold out of size 8 too! damm having big feet! Love those shoes. You have such good style ! Can't believe I've only just found your blog - in love!